GYM Grooming (Gentlemen’s Youth Maintenance) lives by the motto Duty Not Beauty. Founder Chris Campbell, a former makeup artist, hairstylist, and esthetician designed this line because he believes that a man’s appearance directly affects his personal, professional, and social life. “It’s not about being model pretty boys,” he says. “It’s avoiding problems by simple maintenance, and respecting yourself and others in your life enough to take care of yourself and to look your best. GYM has it all – haircare, skincare, and bodycare. Choose from shampoos and conditioners that create volume and moisturize, then pick your styling weapon. Use the shaving gel for a close smooth shave and to help prevent nicks. And don’t forget to wash and moisturize your body. Even L’Oreal has gotten into the game with their Men’s Expert skincare line. According to dermatologist Dr. Lydia Evans, men and women suffer from the same skincare issues, but men’s skin differ from women in that men have thicker and oilier skin, more prominent pores, and their faces truly suffer from regular shaving. “It’s not just about after-shave balm, it’s about total skincare,” she says. Just some of the products you’ll find in this line include after-shave balms and moisturizers with SPF 15 because men need sun protection too, a face wash that deep cleans, an exfoliator that can be used 2-3 per week to remove dead skin cells, an undereye moisturizer to treat dark circles and reduce puffiness, and an anti-aging moisturizer to reduce the appearance of fine lines and wrinkles on the face and neck. 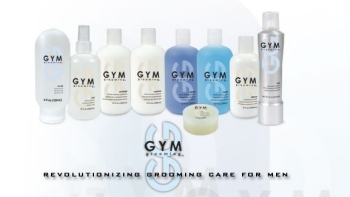 Visit www.gymgrooming.com to purchase products and activewear. Men’s Expert can be found in chain drug, food and mass market retailers nationwide. Point: Beauty is not vanity, it’s a necessity.